Introducing the exciting new Smart Videohub, the world’s first Ultra HD mixed format routers with built in video monitoring and spin knob router control. Smart Videohub includes the latest 6G-SDI or 12G-SDI technology depending on the model, so you can simultaneously connect and route any combination of SD, HD and Ultra HD video, all the way up to high frame rate 2160p60, all on the same router at the same time. You also get revolutionary new visual routing that lets you see your router connections as video on the built in LCD as you scroll the knob to select your routing. Now you can route your video simply by looking at the video. Broadcast grade routing that's easy to use. Smart Videohub is perfect for broadcast, post or live production. 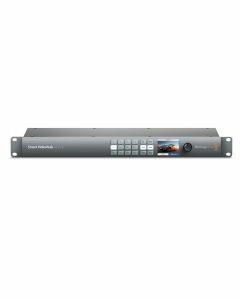 Smart Videohub’s super compact size means it's perfect for use in large broadcast systems or portable mini racks for live production where cameras, switchers, recording and monitors are all simply connected to Smart Videohub. Now you can avoid messy rewiring because you can connect everything to the router and then quickly change connections from job to job without reconnecting a single cable. Innovative control and monitoring in a compact design. Smart Videohub's beautiful machined aluminum design features new innovative video monitoring control. Now you can visually route video because the built in monitor lets you see live video, crosspoint connection labels and TV formats displayed simultaneously. You can make selections with the spin knob or switch video with the dedicated button panel. Choose from three incredible models. The Smart Videohub 12x12, 20x20 and 40x40 all feature the amazing new control panel, built in power supply, network control and advanced 6G-SDI connections in a compact design. You can even configure all IP settings on the front of the unit without a computer. Route your video by looking at it. Scan through video at lightning speed. Smart Videohub's super fast spin knob control lets you dial though your router cross points while displaying live video combined with custom on screen labels. Scroll order is arranged alphabetically so it’s easy to find the crosspoint you are looking for. The spin knob control combined with visual routing is the fastest way to route. Imagine scrolling through your connections while viewing them as live video on the LCD. On screen labels support unicode so they work in non Roman character sets such as Chinese, Japanese, Russian, German, French, Spanish and more. That means if you have labels in Japanese it will appear on the front panel in Japanese exactly the same as it appears on the software control panel on your computer. Built in video, label and format monitoring. Now you can monitor all the live video connected to your Videohub. The built in LCD lets you see your video in virtually every TV format. That means you don't need a separate external monitor because it's built into the front panel of the router itself. You can look at any source or destination and confirm the correct video inputs are being sent to the correct video outputs. Built in monitoring is perfect when space is tight, such as mini racks and broadcast trucks. Up to 40 x 40 size for advanced routing applications. Ultra HD Quality, HD Compatibility. SDI Video Input: 12 x 10 bit SD-SDI, HD-SDI and 6G-SDI. SDI Video Output: 12 x 10 bit SD-SDI, HD-SDI and 6G-SDI. Reference Input: Blackburst and TriSync for SD, HD and 4K. Multi Rate Support: Auto detection of SD, HD or 6G-SDI. Simultaneous routing of 4K, HD, SD video and DVB-ASI. Router Control: 12 buttons for local control of Videohub. 6 buttons and scroll wheel for control of LCD display or RJ45 Ethernet. Router Configuration: Via front panel LCD or use either RJ45 Ethernet or USB 2.0 for setting IP address only. 4K Format Support: 3840 x 2160p23.98, 3840 x 2160p24, 3840 x 2160p25, 3840 x 2160p29.97, 3840 x 2160p30, 4096 x 2160p24. SDI Audio Sampling: Television standard sample rate of 48kHz and 24 bit. Software Control: Router control included free for Windows and Mac OS X. Displays: Built-in LCD for video and menu settings. Power Fail Protection: Router connections preserved and restored instantly at power on.